For their 2016 fall and winter concerts, I created a unified theme for the Pacific Spirit Choir posters. Using different kinds of stock images, I kept a consistent look with the large rectangular panels, and bold colour gradients. Each poster had to be re-interpreted as a bookmark as well, adapting the elements of the larger image to a smaller, narrower area while retaining the legibility and feel of the original. I’m looking forward to taking this same style into their spring concert poster for a fully cohesive 2016/17 season! The dust has finally settled after the July Cor Flammae concerts, and we are so pleased to have another successful summer concert series under our belts, and grateful for the artistic experience that came together. When we chose REFUGE as a theme, it was months before the terrible events at Pulse Nightclub in Florida occurred, but rehearsing in the aftermath we were reminded of why we do what we do. Providing a space for queer singers to make art about survival, and providing a space of meditation on this experience for audiences, is not just an academic exercise but something necessary and artistically relevant to our lives. The point of art is to reflect, parse, transform and bear witness to the realities of the human experience. When people question “why queer art,” this year’s concert allowed us to answer that the queer experience needs to be heard and seen – queer art is a shelter; one that both saves us from the world and allows us to remake it with more room for difference. In making art about the queer experience we do as we always aspire to – connect the abstract beauty of music to that vital heartbeat of human life. On that note, this year’s programme was a special undertaking. Learning about music history brings the pieces and composers to life for me, not only letting me geek out and expand my own knowledge, but also explore my favourite challenge: how to then translate that experience to the reader. My hope is that it works in concert with the performances to allow listeners to fully engage with this music. 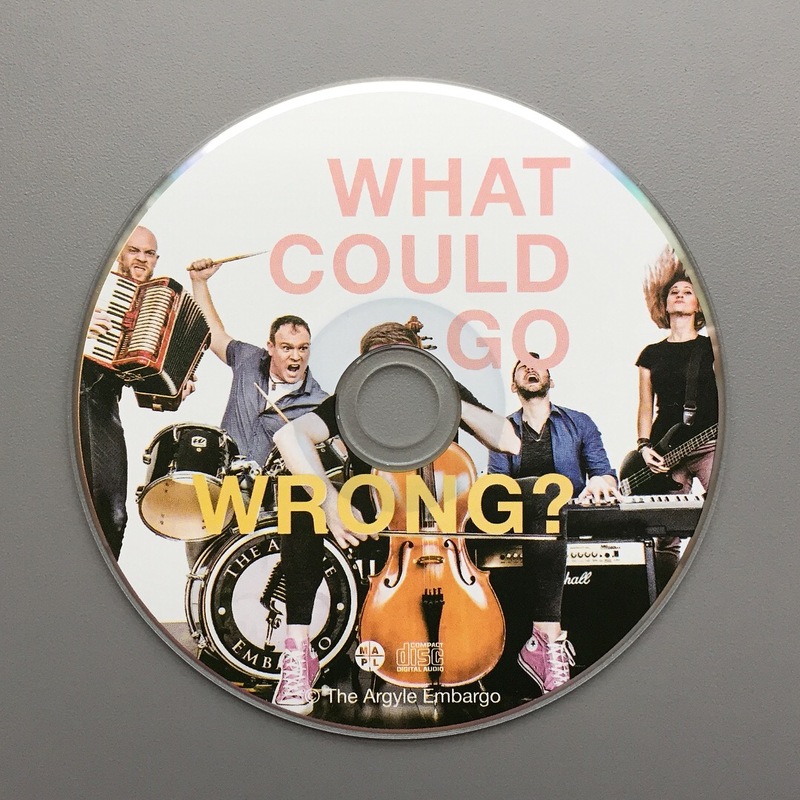 You can find the programme at issuu.com, and recordings of this summer’s performances at bandcamp.com and YouTube. I’m pleased as punch to have put together the spring concert poster for the Richmond Orchestra and Chorus Association and the North Shore Chorus’ spring collaboration. 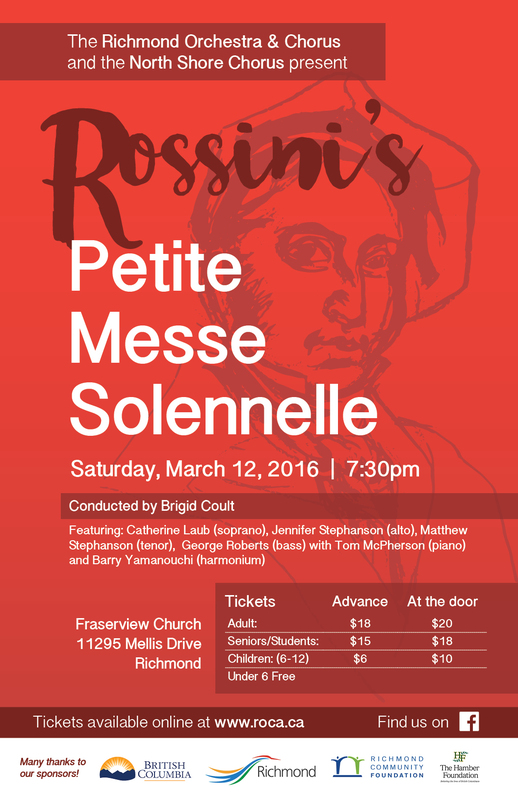 They will perform two concerts of one of Rossini’s sacred works, the Petite Messe Solennelle, on March 12th and April 2nd. I had a lot of fun with this one – I did a sketch of a Rossini portrait to use as my background and then scanned it in to my computer, where I changed it into a vector image in Illustrator. I had recently got my hands on some new fonts, and I enjoyed playing with the contrast between the script font of the composer name, and the bold modernity of the title text. I hope it references the traditional aesthetic associated with classical music, and the joyous, expressive energy that comes to mind when I think of Rossini, but with a clean, contemporary feel. ‘Tis the season of song! Whether sacred or festive music, ’tis the season to enjoy a smorgasbord of aural delights. There’s nothing that better embodies the spirit of gathering together to celebrate joy in the bleak midwinter than choral music! 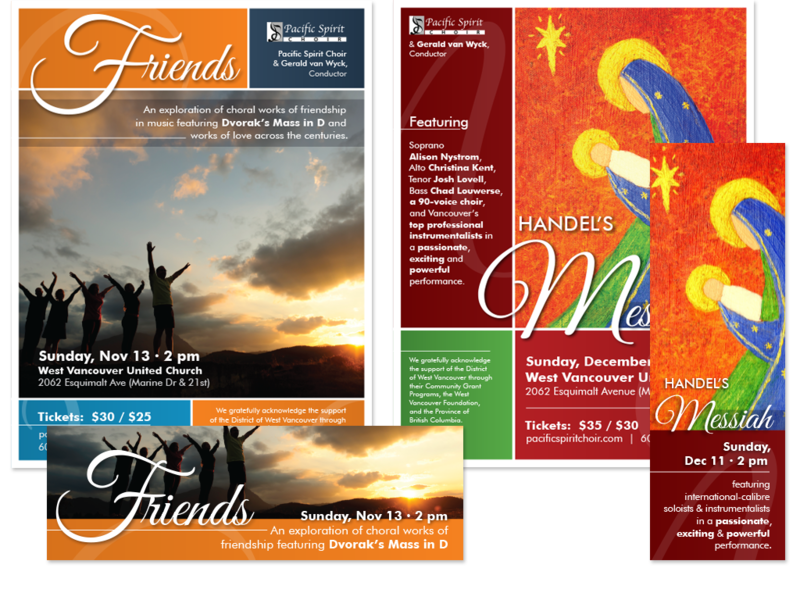 I’m happy to have done the posters for two holiday concerts this year. If you’re on the North Shore and in need of seasonal song the weekend of December 5th and 6th, check them out! If you want something to get you in the holiday mood on Saturday night, The North Shore Chorus and the Carousel Chorus are teaming up to perform a selection of festive jazz music. 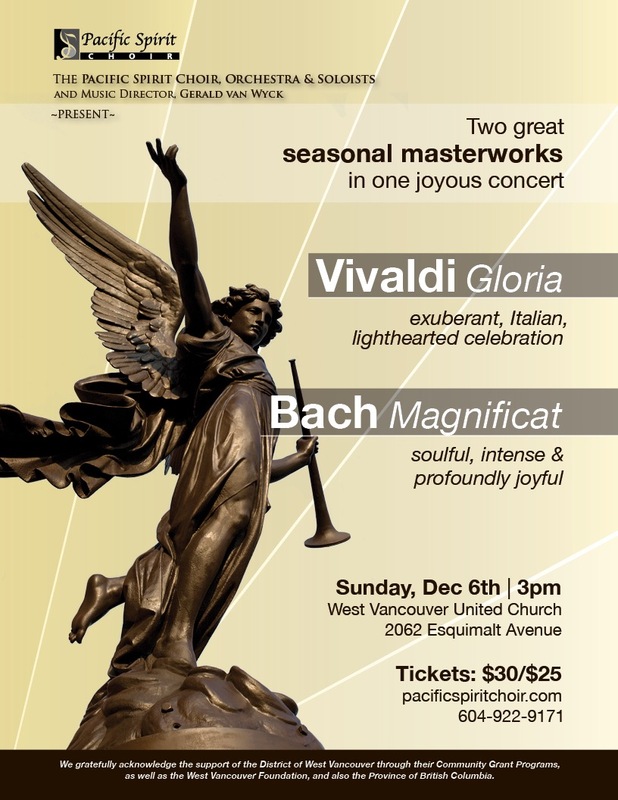 For some seriously jubilant classical repertoire, check out the Pacific Spirit Choir on Sunday afternoon, with their performance of Vivaldi’s Gloria, and Bach’s Magnificat. Recently, I got to work on logo creation again, this time for Studio 209 salon! Since the salon is in a heritage building, we wanted to pull an antique feel into the logo, going with a beautiful serif font, a soft grey and inverse rounded corners. I created a square and long version, since a logo needs to be flexible and translate regardless of size or where it’s being used. 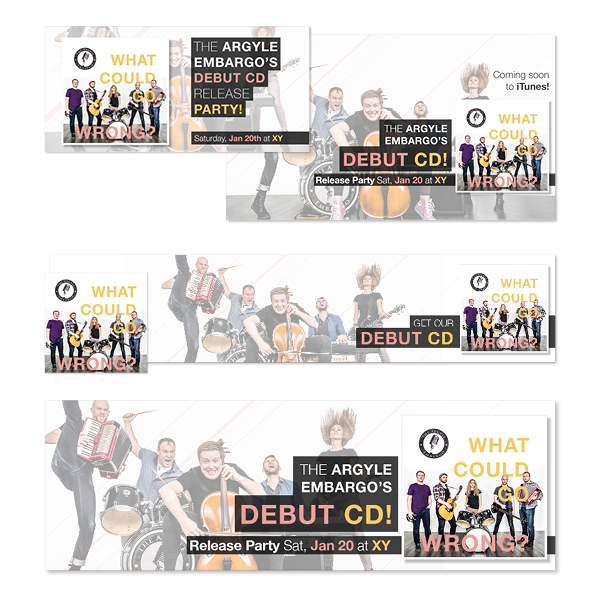 So far they’ve been used in a window cling for the front door, the website and the business cards. In my designs everything should relate to a single idea or inspiration, and for Studio 209 that cornerstone is the physical space. Every business in this heritage building has gorgeous frosted glass doors and hallway walls, each with its own unique pattern. For the business card, I took a photo of the salon’s door – its luminous champagne coloured “fingerprint” – to use as the background, welcoming you in to the warm environment inside. Last year I had the immensely rewarding and transformative experience of helping bring a new ensemble to life, as part of the Cor Flammae administrative team. If you haven’t seen my previous posts, Cor Flammae is a classical music choral ensemble aiming to celebrate queer composers and vocalists – the only one of it’s kind in Canada – and I’m happy to report we completed it’s inaugural concert to a hungry and excited audience. We sold out 250 seats, and had to turn away another 100. There were even scalpers, which pretty much never happens in classical music. I have been a life-long choral music audience member, with an ever growing interest in the world of arts admin, and a fascination with the puzzle of how to generate the positive feedback loop of audience engagement and participation that makes a stable arts venture. It was with great delight that I lent my abilities with a keyboard and a pencil to the Cor Flammae effort, jumping into the tasks of fundraising and print design. 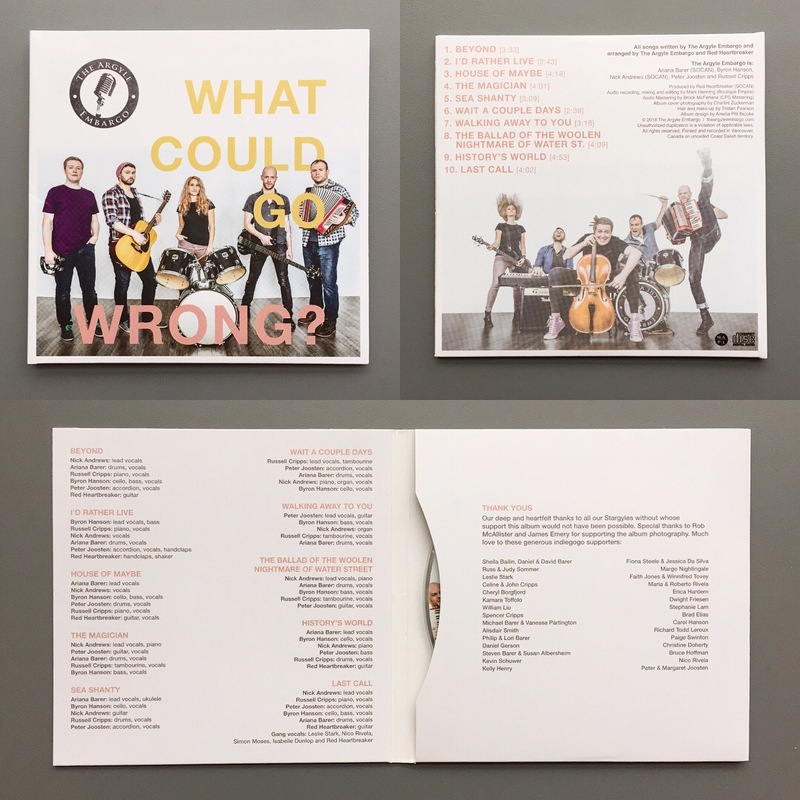 Audition posters, fundraising graphics, thank you cards and concert posters were all fun ways to engage and hopefully inspire folks to be singers, patrons and philanthropists for this brand spanking new choral group. Working on the branding vision with the choir’s Managing Director (my lovely and multi-talented wife) Missy Clarkson, we wanted something clean and modern, that would both reflect the seriousness of the talent and the music involved in the project, as well as create a fresh and contemporary appeal. Inviting people into this project, whether they were classical music people or totally new to the world of choir, is a core value for us – this project has purpose and something to say, new art to make, and we want to share an angle that hasn’t yet had much real-time application (though there is quite a bit of interesting scholarship on queer musicology – Queering the Pitch is a fascinating read) with anyone who would be interested. This also lead me to my favourite part of the project, the programme. I’ve designed programmes before, but the great joy of the Cor Flammae programme was the copywriting I did in addition to layout. Researching the amazing composers, building off the bios Missy had compiled on the website, and trying to synthesize something we could share with the audience about their contexts, music and personal stories that would illuminate the concert experience was both an incredible deepening of my own knowledge, as well as a chance to geek-out as a writer and flex my academic training. It was a wonderful experience, and now we’re looking forward to creating the same magic for the summer of 2015. Performances are on July 17th and 18th, when we’ll be performing an incendiary concert of sacred and profane works by queer composers. Come check us out! It’s time for this year’s Genderfest! Genderfest is an East Van celebration of queer pride, that brings together a bunch of great events that celebrate gender diversity. It’s a festival I really believe in and I was so pleased to be asked back this year to do the promotional graphics! We put together a poster listing all the events, with a luscious west coast background, which I got to use my wacom tablet to draw some ferns for. I also had a blast creating an alternate interpretation of the Genderfest unicorn logo into a simplified banner image, and update the website background to match. Expanding the web graphics side of things from last year, the Facebook banner I created lists all the events and describes the festival, in case folks want a quick cheat-sheet of what’s going on. 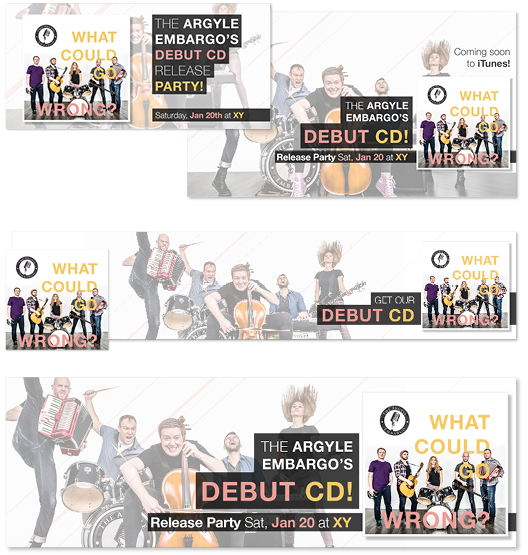 The really cool part of this year’s promotions is a folding business card with all of the event listings. The idea is that instead of having a bulky flyer that people toss away or tape to their fridge at home, this is something they can carry around in their wallet and open it up when they’re out on the town. The final Genderfest event is Unicorn Born – an epic East Van dance party (19+) happening this Sunday at the Maritime Labour Centre (1880 Triumph St). 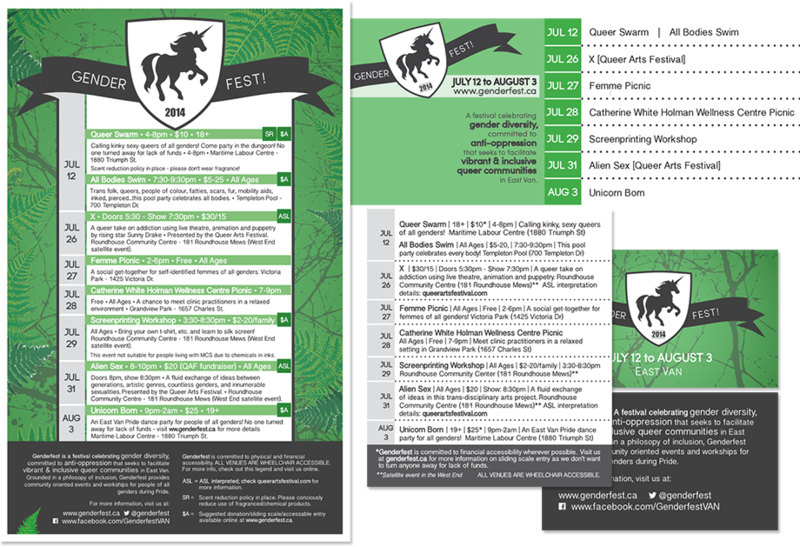 Check out the Genderfest website for Unicorn Born accessibility information. I’ll see you there with my dancing shoes on! Cor Flammae Promo Poster is Printed! 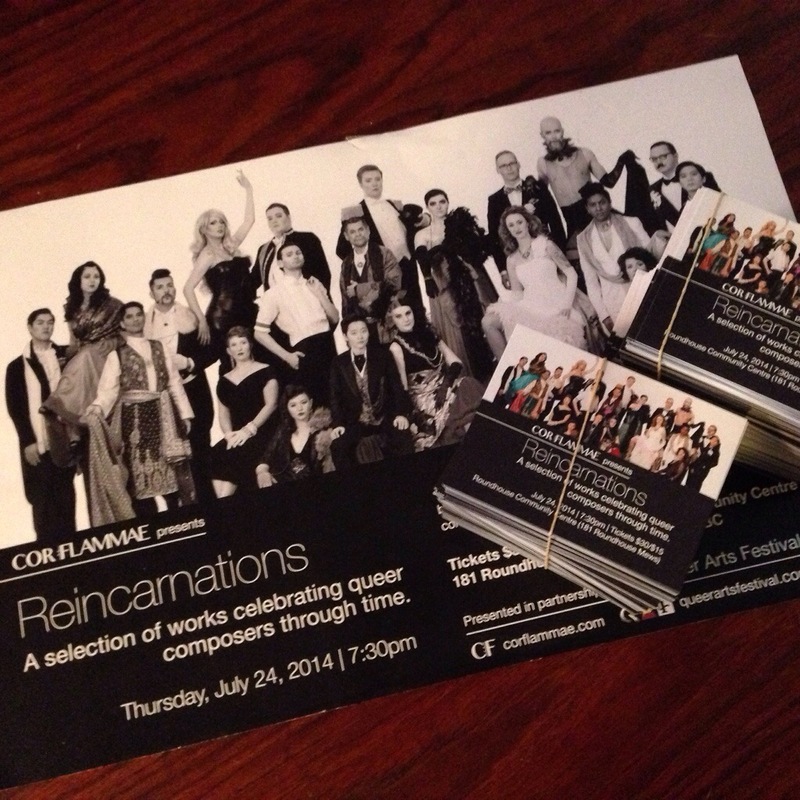 The posters and flyers for Cor Flammae are home from the printer and I couldn’t be more pleased. There’s nothing like holding the real things in your hands, and it’s amazing to realize that it’s almost showtime! It was a real treat working with the fabulous image of the choir shot by the talented team at belle ancell photography. Now to distribute these puppies all over Vancouver! 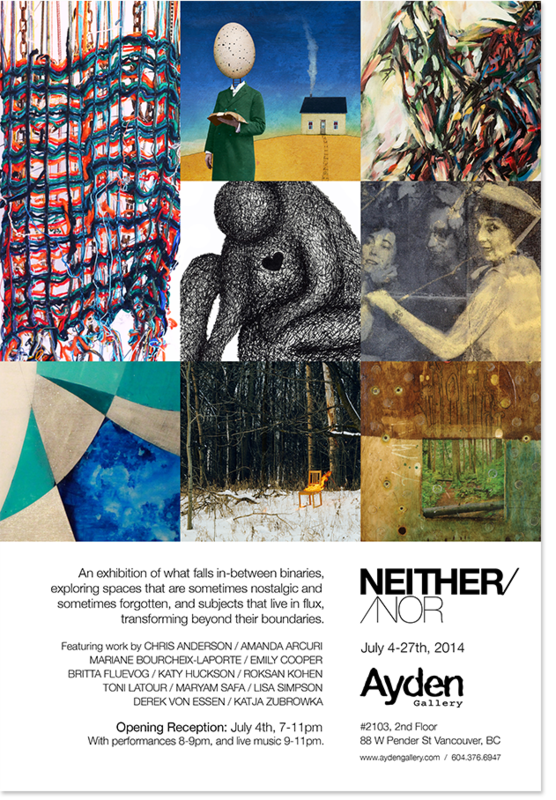 The opening reception is July 4th, 7-11pm, and will feature performances and live music. If you’re looking for something to do this coming Friday, wander down to the Ayden Gallery (2nd Floor, International Village – 88 West Pender Street) and check out this great show!